An all-natural organic weed and feed for use on lawns. 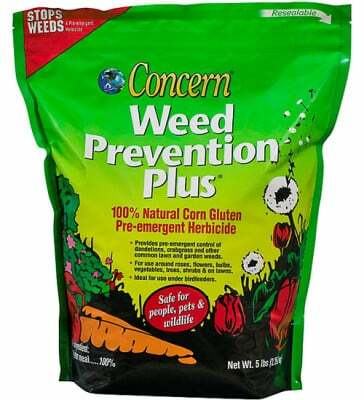 Derived from corn gluten meal, Concern Weed Prevention Plus provides a fast green-up and will not burn. 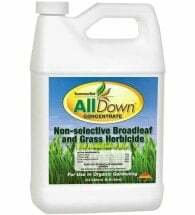 Prevents crabgrass, dandelions and many other common weeds. Pelleted for easy application. Safe for people, pets and wildlife. Each 5 lb bag covers 250 square feet (25′ X 10′). 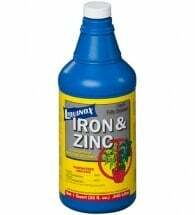 Garden: Prepare garden bed by turning under or pulling established weeds, then sprinkle by using the convenient shaker bag or apply by hand around bedding plants, flowers or shrubs. Rake lightly into soil. 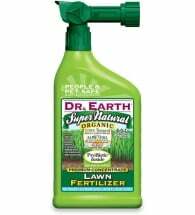 This all natural weed preventer and fertilizer works best if applied, watered in, and allowed to dry for 2-3 days. If excessive rain occurs, reapplication may be necessary. It keeps working 4-6 weeks. Reapply as needed. Do not apply on newly seeded areas. However, it can be used with confidence around transplants. Lawn: Spread evenly over lawn grass using the shaker bag, by hand, or in spreader. 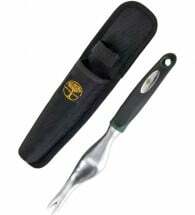 Avoid any bare spots where you are re-seeding. Sprinkle in cracks on sidewalks and driveways. Works best if applied, watered in and allowed to dry for a period of 2-3 days. If excessive rain occurs, reapplication may be necessary. Application Rate: Apply 5 lbs per 250 sq ft (25′ x 10′) to turf or garden soil. If you choose you can use twice the recommended rate for even better control with no fear of burning our plants. When to Apply: Your first lawn application should be in the early spring, 3-5 weeks before weeds begin to sprout. This is about the time the crocus and daffodils are blooming in your area. Re-apply in late summer when temperatures turn cooler to control late season weeds. Barnyard grass, smooth crabgrass, curly dock, green foxtail, black nightshade, orchard grass, shattercane, purslane, wooly cupgrass, giant foxtail, lambs quarter, buckhorn, quack grass, velvet leaf, annual bluegrass, dandelions, creeping bent grass, black medic, redroot pigweed, catchweed bedstraw, clover, and other common garden weeds.